7/7 UPDATE: A Magistrate Court judge today denied bond to the Smiths, who remain in custody at the Appling County jail. Judge Ronnie K. Lewis ruled that the couple--who spent nearly two weeks on the lam before their surrender--was a flight risk and a danger to the community. Lawyers for the Smiths will have an opportunity to petition for the duo’s pre-trial release during a future hearing in a higher court. Two weeks after a Georgia restaurant owner and her teenage daughter were beaten by a couple unhappy with their chicken order, the alleged assailants today turned themselves in to police. 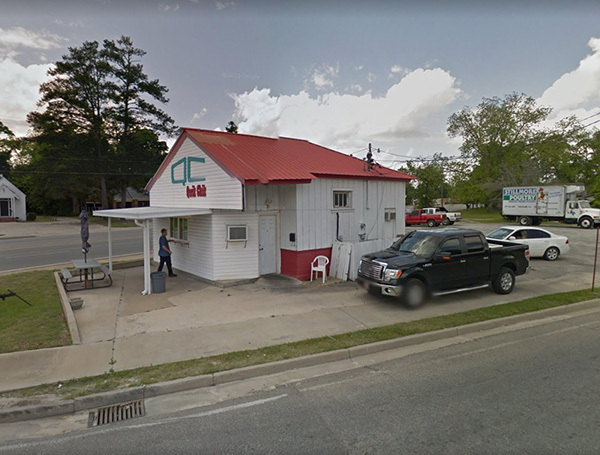 Nathaniel Smith, 45, and LaTasha Smith, 28, surrendered to face felony charges in connection with the June 22 incident at the Qwik Chik takeout stand in Baxley, a city about 90 miles west of Savannah. The Smiths were the target of a law enforcement dragnet that included police and federal marshals. According to investigators, the Smiths (seen below) complained to eatery owner Jeanette Norris that their chicken was cold and that they did not receive a sufficient amount of French fries. When the dispute escalated, Norris dialed 911 (after having refunded the couple’s money). As seen in the above surveillance footage, before cops arrived at Qwik Chik, LaTasha Smith attacked Norris with a flurry of punches. When Norris’s 15-year-old daughter sought to aid her mother, Nathaniel Smith sucker-punched the girl in the face. Norris was left with two black eyes and a broken nose, while her daughter suffered a concussion and a black eye. Following the assault, the Smiths fled in a Cadillac Escalade and remained on the lam until this morning. The couple was being sought on warrants charging them with aggravated battery and cruelty to children. Nathaniel Smith has a prior felony conviction for the sale and distribution of cocaine and marijuana. The Smiths, who live in Savannah, have yet to appear before a judge.